With many successful business stories of our Drupal Design and development Arthisoft has a leading and highly experienced team of Drupal developers who can provide you with highly customized solutions. We create only highly secure solutions for the with rich features which will result in high performance of the site. Our Services include development in Strategy, Design, Theme module development which will be delivered by our experienced developers. Why you should choose Arthisoft for Drupal Development? Our developers are Capable of developing personal and corporate Websites and blogs, social networking platform systems and Ecommerce Sties. 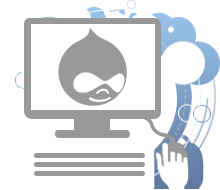 Our team is always updated and is aware with the latest market knowledge of the Drupal development technologies. You can also hire a dedicated and experienced Drupal Developer from Arthisoft who will be completely working on your website platform. We have excellent experience and knowledge in designing beautiful themes and we have also mastered all the different usability of the Drupal CMS and we can build you systems to improve your web presence.